I am so excited I can hardly stand it – I am getting my own craft/sewing/art room, and I didn’t have to wait for the kids to grow up and move out so I could take over one of their rooms! I feel like I need to give a little background before I really get into this post. Last Spring, we gutted and remodeled our entire house before moving in (Todd has owned it for many years, and has had renters in it). Before the remodel, it was a 3 bedroom, 1 bath with an attached garage, exterior shop, and garden shed. After we finished the remodel, it is now 4 bedroom, 2 bath, an outdoor Family Room/Theater (former shop), and garden shed. We converted the garage into the master suite and a laundry room, and finished the shop to use as our Family Room/Theater – otherwise known as the Nerd Castle. 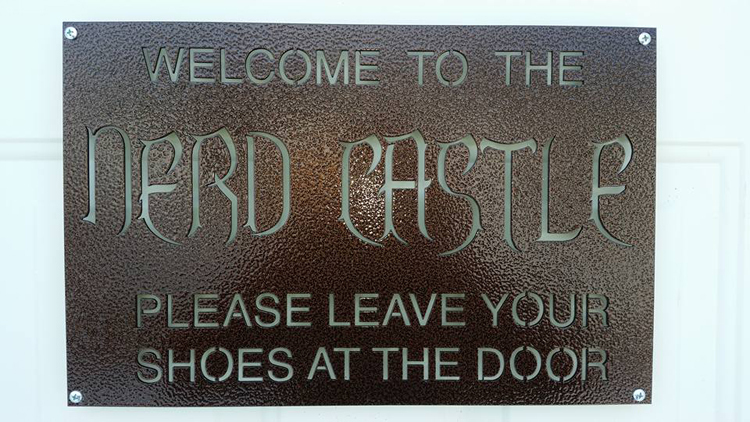 This is the sign I had made for Todd for Christmas for the door of the Theater. I have been slowly writing about the process of remodeling each room, and the changes we made in them. If you’re interested, you can read all the Home Remodel Posts. Even with the remodel, though, our house just isn’t big enough for me to have a designated craft/sewing room. We do have short wall that belongs to the kitchen pantry on the left and coat closet on the right, and that area has become my sewing space. I started with folding TV trays, and now I use this amazing Sewing Cabinet my dad built me, and the space has worked wonderfully. We do have a few small projects leftover from the remodel that didn’t get done last summer that we are getting ready to start on. We put house wrap over the portions of the house where we blocked a window or door, but we didn’t get the siding added before winter. We need to re-stain our fence, and the garden shed was never sided and it is starting to fall apart so we are replacing it. Once the new shed is built and the siding is fixed on the house, we are painting both. Originally when building the shed we were going to make it big enough for all our yard/garden tools in one room and have an additional little room for extra storage and a deep freezer. Somehow, Todd got the idea of turning one half of it into a sewing/craft/art room for me, and after talking a little bit about what limitations it will have, plans are in full swing! 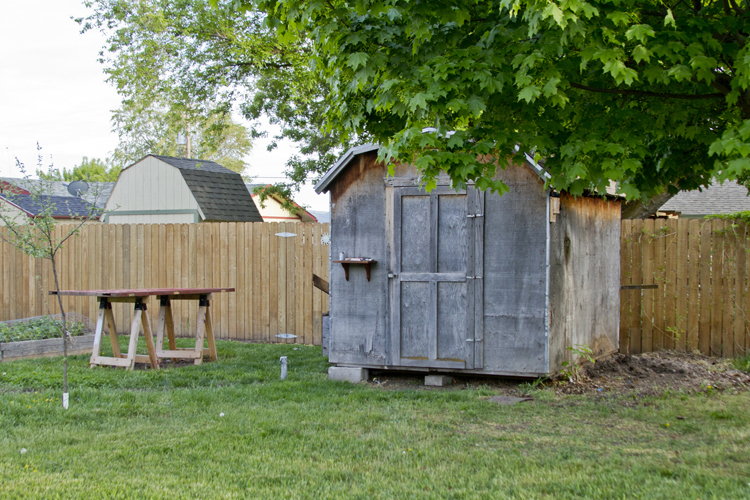 The new shed will be 12’x24′, and it is going to be divided in half. 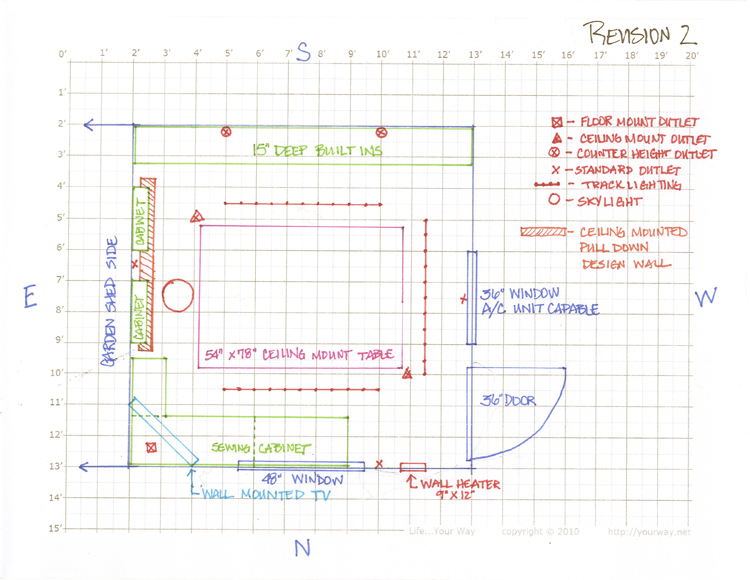 Each “room” will end up being 11’x11′ with separate entrances for each. The new craft room will also have two windows for nice natural light. We are planning on installing built-ins along the south wall for storage, my sewing cabinet will be in northwest corner, and I will have a roll-down design wall on the west wall – it will be like a projector screen that I can pull down when I need it and put away when I don’t. This sketch is just preliminary, but it gives a pretty good idea of what type of space and room I will have. I already have the sewing cabinet my dad built (the dashed lines are where it folds to close up completely), and the two wall mount cabinets are being built right now by a friend of ours. They were originally being built for my current space, but they’ll go really well in the new room! Being the Pinterest fan I am, I immediately started a Pinterest Board to organize all my ideas and wish list items for my room. 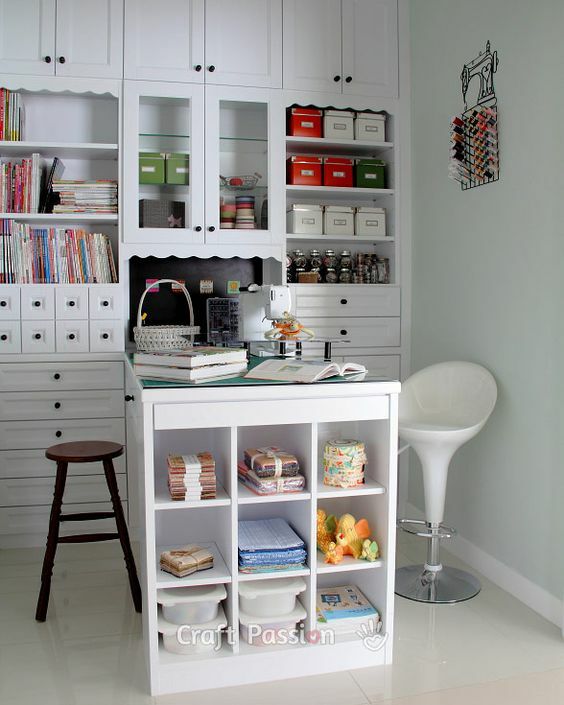 I have found a lot of inspiration for storage and organization! For the built-ins, I would ultimately like to have closed storage on the bottom half of the wall with a counter and then shelving with glass doors above so I could display pretty fabrics, collections, etc., and keep the not so pretty craft items hidden below. What we end up doing will totally depend on budget and timing. I think built-ins similar to this would be amazing! The best part will be the store-in-the ceiling 4’x6′ table Todd and my dad are engineering! There is really no way to explain it other than it will be a 2 piece (each piece 3’x4′) table that has detachable legs. The table-top will store on a built-in box (like a soffit) in the middle of the room, and it will be held there with earth magnets. The legs of the table will have casters, and they will attach to it with the same magnets and will also be stored in the ceiling. I envision that one half of the table will stay down nearly constantly, and I will only have the entire thing down and in use when I have a huge project to cut out. The table(s) will also have two sets of legs – one that raises them to counter height, and the others will be at desk height. The legs I use will depend on the project I’m working on, whether it’s sewing, scrapbooking, or an art project. 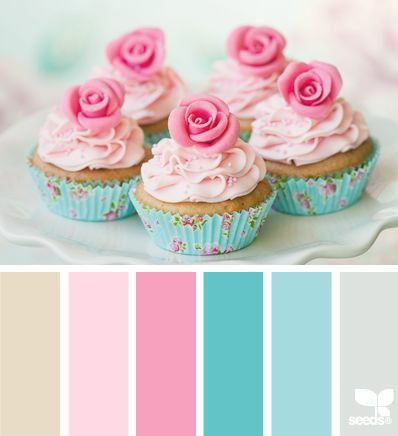 While researching She Sheds and Craft Rooms, I have found that a particular color palette is drawing my eye and keeping my attention. 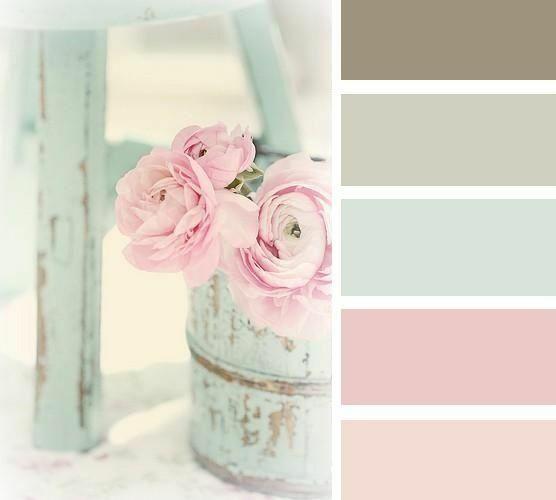 I don’t know if it is the soft, serene colors, or if it is because the colors seem to be on trend right now. Either way, I really like them, and I see the inside incorporating something similar to these in one way or another. 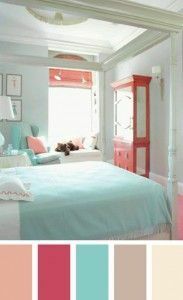 I am pretty positive this is how we plan on painting the house and shed (the tan and white, ignore the turquoise for now). I love how warm it feels. I know we won’t be able to get it completely finished immediately, but rather it will be an ongoing project until it is finished. I am so excited to get started tearing out the old shed and starting on the new one. It will be amazing to have my own space to sew, craft, and make messes without constantly having to worry about putting it away mid-project just in case company comes to visit. 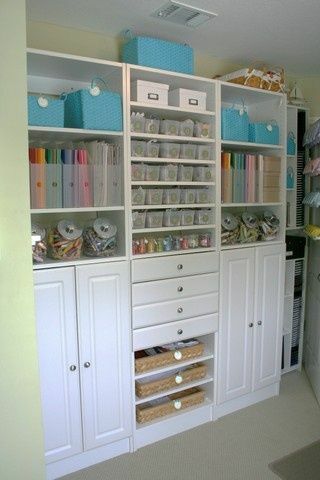 What are your tips for organizing and designing your dream craft room? Linking up at Made by You Monday, Show & Tell Link Party, Wow Me Wednesday, Whoop Whoop Fridays, Finish it up Friday, Friday Finds Link Party, and Show off Saturday.